Join with Thrive! and together help build and sustain a thriving future for all forever. Help create and empower a vast, sustained human endeavor building and sustaining thriving and surviving future for all forever. Act to help build and sustain a thriving future for our people, communities, states, nations and world. 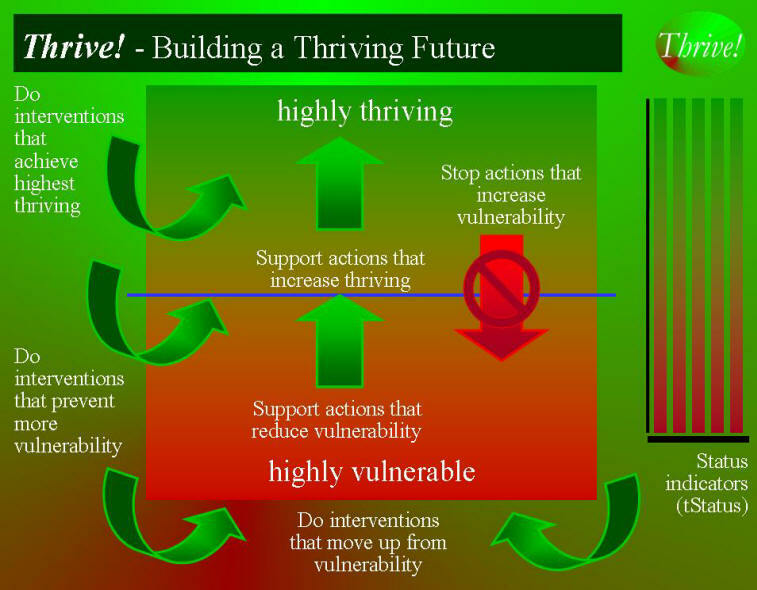 Spread the word on and network in support of the Thrive! vision, mission and call for action, including use of "eMedia" (social and other media, blogs, etc.). When taking action, use the Thrive! strategies below (more at viaFuture.org). viaFuture supports Thrive! by providing strategies, models and tools to help create and sustain large, positive, strategic and operational change. Strive to achieve a thriving and surviving future for all forever. Also help ensure survival, a necessary but not sufficient step. Join people of all backgrounds and generations to achieve a thriving future. Address every person, community and issue. Use whole "community" (local, regional, State, national, global) strategy, change and thriving futures. Use whole "person" strategy, change and thriving futures. Use whole "system" (community, health, education, economy, housing, etc.) strategy, change and thriving futures. Take integrated approach to cross-cutting issues. Use integrated people/environment strategy, change and thriving future. Use a "person-centered" strategic approach that recognizes people's behaviors are both problem and solution. Use strategic/operational planning with strategic/operational management and execution. Use next generation viaFuture strategy, models and tools to create/sustain change and build thriving futures. Use "eMedia", including social networks, to expand communication and joint action and activate a vast movement in "real time".